Lasipalatsi’s meeting and banquet facilities are suitable for all occasions. 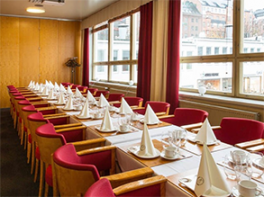 Lasipalatsi’s festive and conference facilities in a unique setting in the centre of Helsinki are an excellent venue to host successful events. Our versatile and adaptable facilities can be used for meetings, meetings, seminars and great gala dinners, without forgetting family reunions or corporate events. We rent our rooms for a minimum of 2 hours. Our restaurant will provide quality food according to your wishes, and after the event you can head to our stylish bar. 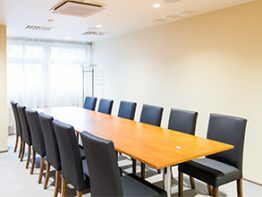 Our central location, as well as our convenient accessibility, make it easy for guests to attend meetings, invitations to parties and other events. The Forum, the Eliel and Kamppi parking halls are a stone’s throw away and the railway and bus stations are also located in the immediate vicinity of Lasipalatsi. 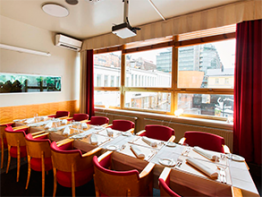 Reserve a room for your party or meeting in the very best location in the centre of Helsinki – Lasipalatsi is an unforgettable venue for any event. Check out our cabinets and contact us for more details. 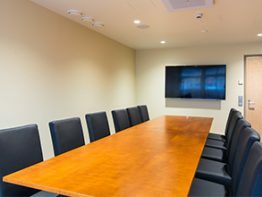 Our meeting rooms include six different sized cabinets, from which you can book the most pleasant and suitable space for your occasion. You can make a reservation through the offer form or by contacting us. 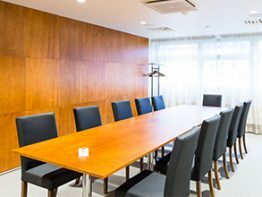 The cabinet rooms can be booked for a minimum of 2 hours. 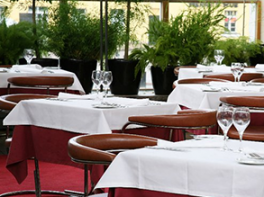 Our bright, high and spacious winter garden offers unobstructed views of the city centre. The windows open to Mannerheimintie and Narinkkatori; The space is separated from the dining room with a glass wall that also ensures visibility to the dining room side. The room is decorated in original 1936 style and is ideally suited for breakfast, banqueting lunch or festive dinner. The space can be used to organize press conferences, launches, product presentations, or other events or celebrations. There space is for 54 to 60 people and can be adapted to suit the nature of the event. TABLE SETTING: Theatre style for 60 people, U shape table for 34 people and diplomat style for a maximum of 24 people. The traditional table setting for large groups is two large tables or several groups of smaller tables, depending on the number of people. A pleasant cabinet with a window that is decorated with the same style and materials as the restaurant and the Helsinki cabinet. The room’s area is 15.5 square meters. Spacious and luminous window cabinet. Equipment; Plasma display, wifi. The room’s area is 24 square meters. Equipment; Plasma display, wifi. The room’s area is 29 square meters. The prices include value added tax, the meeting space and the equipment (video projector + screen or plasma TV, note taking supplies and a flipchart if requested) as well as ice water throughout the event. You can also change in advance the business lunch to Restaurant Lasipalatsi’s classic menu, extra charge 20,00 € per person.